The banded gourami, Colisa fasciata has high food as well as ornamental value in Bangladesh and demanded species to domestication due to rapid declination of natural population. The spawning performance of C. fasciata was investigated by using different hormones in the captive aquarium condition. There were three treatments conducted such as induce breeding using PG (T1), HCG (T2) and ovaprim (T3). Each treatment had two more replications. In each aquarium, single pair of brood was stocked. The water parameter ranged such as temperature, pH and DO were 26-29º C, 7.2-8.5 and 3.5-4.5 mg/l respectively. Hormones were administered into female in two doses; a lower priming dose followed a 6 h interval by a higher resolving dose. In first dose, PG, HCG and Ovaprim were injected in female at 10 mg/kg, 400 IU/kg and 0.5 ml/kg of body weight respectively. The second dose was applied to both male and female and female received double amount than the male. Among the three treatments, 100% spawning occurred at T1 and T3 after 11 and 16 h respectively. Fertilization rate was 76.7 ± 4.71%, 46.7 ± 9.43% and 86.6 ± 9.43% in case of T1, T2 and T3 respectively. The larvae was hatch out after 23-26 h of spawning and hatching rate was 46 ± 1.41%, 34 ± 2.83%, and 52 ± 3.54% in T1, T2 and T3 respectively. It is indicated that the use of ovaprim (T3) was more effective in induction of ovulation, fertilization rate and hatching rate compared to other spawning stimulants for C. fasciata. The banded or giant gourami, Colisa fasciata (Bloch & Schneider, 1801) is one of the important indigenous fish species as it is a dual purpose fish for its delicious taste, meeting the nutritional requirements of people as well as ornamental values in aquaria (Goodwin, 2003). It is locally known as “khailsha” and found all freshwater areas of Bangladesh. The fish is usually found in streams, pools and ponds. It is very hardy and found survive and breed in foul water (Bhuiyan, 1964). The species is naturally distributed in Bangladesh, India, Myanmar, and Nepal and widely transported around the world (Welcomee, 1988). The species have also gained importance for its ecological value for controlling mosquito transmitted diseases like Malaria, Dengu, Chikungunya etc. due to feeding on mosquito larvae. However, the fish is yet has to import from India (Tripathi, 2004). The species is declining rapidly from our natural habitat due to drastic reduction of the natural feeding and breeding ground as a result of human intervention and modification of its habitat (Hossen et al., 2014). Over exploitation and applying pesticides and insecticides in nearby agricultural fields are the main reason to be the threatened for ornamental fishes (Behara et al., 2015). At present C. fasciata is under ‘least concern’ category in the IUCN red data book (IUCN Bangladesh, 2015). The fish is not yet incorporated in inland culture system in the country. The main reasons behind this are insufficient information on the captive induced breeding technology, inadequateness of natural fry and absence of commercial hatchery production. Considering the importance of the species, adequate research in this field is required. Notable works have been done on banded gourami such as Welcomee (1988) worked on distribution of C. fasciata; Sugunan et al. (2002) and Tripathi (2004) studied on ornamental value as an indigenous aquarium fish in India; Behra et al. (2005) have studied on the reproductive biology; Bindu et al. 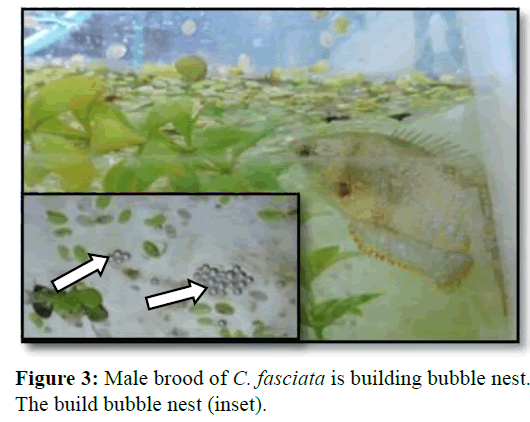 (2014) studied on the Breeding and early development of the nest building gourami Trichogaster trichopterus. In addition, Hossain et al. (2010) tried to the development of low cost culture technology for indigenous ornamental fish such as C. fasciata and gutum, Lepidocephalichthys guntea using carp pituitary gland (PG). In the very recent, Abujam et al. (2015) conducted experiment on captive breeding of Trichogaster fasciata with ovaprim injection in India. But so far no works have been done on the induced breeding of C. fasciata with different hormones in and abroad. Thus present work was conducted first time in the country to characterize the breeding protocol of the C. fasciata considering the various hormonal responses. The experiment was conducted at the laboratory, Department of Fisheries and Marine Bioscience, Jessore University of Science and Technology, Bangladesh. All preparation needed for induced breeding of ornamental fish were done in the laboratory. Aquarium set up, water supply facilities, working space etc. were assured before the breeding program. About 200 broods of C. fasciata were collected from local Baor called Majdh Baor. The collected fishes were acclimatized first in aquarium water and then stocked in the previously prepared aquarium (Figure 1). The fishes were fed with tubifex worm at the rate of 5% body weight. As the fish are omnivorous sometimes they were fed small grass and duckweed. Regular monitoring was done with the cleaning of wastes twice daily (morning and evening) with siphoning. The fishes were reared up to three months until they show secondary sexual characteristics and ready for spawning. During this period, continuous aeration was done by aerator. Figure 1: Rearing of brood C. fasciata in glass aquarium in the laboratory condition. Selection of brood fish is the main task on which successful spawning mostly depends. The ripe and healthy male and female brood fish were selected based on physical and visual examination of secondary sexual characteristics i.e., size, color, swollen abdomen and genital openings. Comparatively, the females are smaller, less coloration, heavier and enlarge yellowish belly, while the males are larger, heavily colored and congested belly (Figure 2). The selected male and female were released into the breeding aquaria two days before administration of hormones for appropriate pairing and conditioning of the fish. Figure 2: Male and female brood fish of C. fasciata. Male is large and heavily colored. Female is less coloration and swollen abdomen. The glass aquarium was rectangular in shape and size is 36 inches × 14 inches × 15 inches. The induced breeding aquarium was set up with furnishes. Plastic aquarium plants and water hyacinths were placed in the aquarium for shelter. Duckweed (Khudipana) was used, that helps the male brood in the formation of bubble nest where the eggs are attached after fertilization. The aeration continued until the broods were started to build bubble nest when it completely stopped. Three treatments were designed and considered as T1, T2 and T3 for carp pituitary gland (PG), human chorionic gonadotropin (HCG) and ovaprim respectively. For each treatment three pair of broods (male: female=1:1) were used where single pair stocked in a single aquarium. The hormones were applied at two different doses. The primer dose for female was 0.10 ml/kg, 400 IU/kg and 0.5 mg/kg of PG, HCG and ovaprim respectively. The second dose of female was doubled of the first dose after the interval of 6 hr. The male only received the second dose of hormones (Table 1). Table 1: Doses of hormone for individual male and female broods of Colisa fasciata. Water parameter such as temperature, pH, and dissolved oxygen (DO) were measured daily. Water temperature was measured at each tank using a mercury thermometer. An electrometric pH meter (model no: EZDO, 7200; made in Taiwan) was used for the measurement of pH, a DO meter (model no: YK- 22DO, made in Taiwan) was used for the measurement of DO. The brood fish was collected from the brood rearing tank very carefully with net and place on sponge. Then they were wrapped with soft and moist cloth and hormones were administrated according the Table-1 at the base of pectoral fin. The amount of hormone solution for each fish was determined before according to the body weight of the broods. The results found in the study were subjected to statistical analysis, chi-square test that showed the significance (P<0.05) level of differences between the treatments. This statistical analysis was performed with the aid of the Microsoft Excel 2010. The brood fishes of C. fasciata were reared for almost three months in the experimental aquarium. Through the proper brood stock management, the broods were found to be healthy, fully mature and are ready to spawn. It was found that spawning period was from June to August. Water is an important factor for successful breeding operation. The physico-chemical condition such as temperature, pH and dissolved oxygen of water in experimental aquaria under different treatments were ranged from 26º C to 29.1º C, 7.09 to 8.89 and 3.5 to 5.0 ml/l and respectively. The water parameter in different treatments is mentioned in table 2. Table 2: Average water quality parameters of treatment aquarium of Colisa fasciata. After introducing the hormone, injected fishes started to show their breeding behaviour particularly the male within the few hours. The male C. fasciata started to build bubble nests under the floating plantain leaf and root of duckweed (Figure 3). It was the first indication of readiness displayed by the male. By finishing of the nest building finished, fish was ready to mate and mating started within about 40 min of building bubble nest. Figure 3: Male brood of C. fasciata is building bubble nest. The build bubble nest (inset). Intensification of coloration in males also indicated its readiness and it started to chase the female (Figure 4A). The male initially stroked on the ventral side of the female with his mouth and dorsal fin and then wrapped the female with his body to exert pressure on the belly to expel her eggs (Figure 4B). They mate 10 to 21 times. However, after mating once, they usually take rest about 5 min and then they mate again. A single mating duration is about 30 s to 1 min. Figure 4: Male C. fasciata chase the female fish (A) and mating and depositing eggs (B). Spawning occurred simultaneously and male fertilized the eggs. The eggs were lighter and usually placed and attach with the bubbles (Figure 5). However, male picked up those eggs that sink and those that have floated outside the nest in its mouth and placed into the nest. Eggs were adhered to the nest and floating the surface up to hatching. After spawning male and female fishes were removed from the aquaria as they may take the eggs. Hatching take place at 23 to 26 h after spawning. 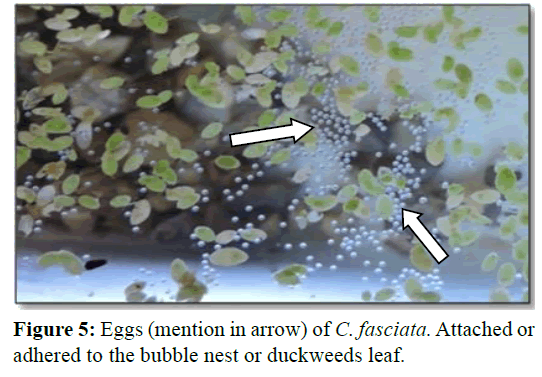 The hatchlings were hanging to the duckweed and attached to the glass of the aquarium as like as hair (Figure 6). 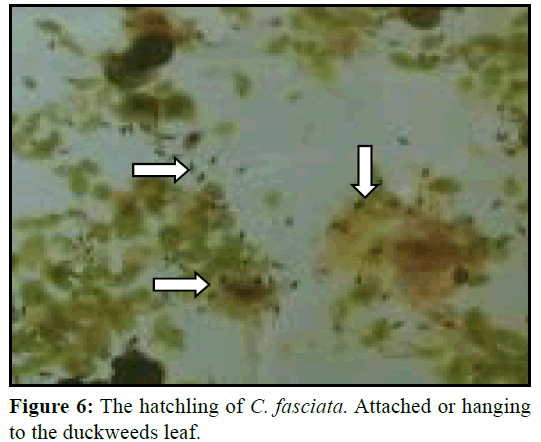 Figure 5: Eggs (mention in arrow) of C. fasciata. Attached or adhered to the bubble nest or duckweeds leaf. Figure 6: The hatchling of C. fasciata. Attached or hanging to the duckweeds leaf. The breeding performance was varied significantly in variation with the different hormones in this experiment. Though all three hormones responded for the inducing of the species, on the basis of spawning, fertilization and hatching performance (Table 3), it may say that ovaprim could be the better hormone for the induce propagation of the C. fasciata. Table 3: Responses of C. fasciata inducing with different hormones/ treatments (Value=mean ± SD; values of the parameter in each column with different superscripts (a, b, c) differ significantly (P<0.05). The spawning first noticed in treatment T1 after about 11 h of injecting the hormones followed by T2 and T3 respectively. The fertilization of eggs completed within 11-16 h after spawning. The significant difference (P>0.05) showed in fertilization among three treatments (Table 4). The highest (86.7 ± 9.43%) fertilization noticed in T3 which was induced with ovaprim and lowest average fertilization rate 46.7 ± 9.43% were obtained by HCG treatment. Table 4: Fertilization rate estimation of Colisa fasciata (Value=mean ± SD; values of the parameter in each column with different superscripts (a, b, c) differ significantly (P>0.05): Five eggs were collected from each aquarium of each treatment). The hatching rate is the portion of the fertilized eggs that came out as developing larvae and was determined by counting the number of larvae from a predetermined number of fertilized eggs. Hatching completed within 23-26 h from the fertilization period. The significant (P>0.05) different noticed in hatching rate and the best hatching rate was 52 ± 3.54% in treatment T3 (Table 5). Table 5: Hatching rate of C. fasciata in different treatments ((Mean ± SD); values of the parameter in each column with different superscripts (a, b, c) differ significantly (P<0.05). Water quality parameters are an important factor for successful breeding. Temperature, photoperiod, dissolved oxygen etc. are responsible factors that might affect the fertilization and hatching percentage of fish (Bakos, 2015). Temperature plays a vital role in gonadal re-appearance and timing of fish ovulation. If the optimum temperature of species cannot be maintained the maturation may delay or the total amount of eggs may also be reduced (Healy, 1971). Axelrod & Shaw (1967) reported that the species breed at temperatures between 18 and 29°C. Axelrod (1996) confirmed that for the breeding of gourami the temperature should be above 26 ºC and temperature preferably around 28-30ºC. Abujam et al. (2015) also found that the breeding temperature varies between 20 to 29ºC. Thus it could be say that the recorded water temperature (26-29ºC) in the present experiment was the optimum level for the breeding of C. fasciata. The water in the present study was a bit harder as pH value recorded 8.23 ± 0.098 (Table 2). This environment may not bad for breeding of the species as it has reported to breed in foul water (Bhuiyan, 1964). In addition, Abujam et al. (2015) also reported successful breeding within the pH range 7.2 to 7.8. The dissolved oxygen in the breeding aquarium was a bit low (4.19 ± 0.03 mg/l) compare to Abujam et al. (2015) who recorded the minimum 5.12 mg/l and maximum 8.06 mg/l. In the present study when noticed to build the bubble nest, the aerator was stopped to avoid breakdown bubble and that’s why may be noticed low DO in the aquarium. The courtship behavior and spawning in the present study noticed after 11-16 h of hormonal injection. The earliest response showed in T1 where PG was injected. However, the earlier response (6-8 h) reported by using ovaprim for the same species (Abujam et al., 2015). The male builds bubble nest in the surface and attached to the water hyacinth (Fig. 3). This is similar to Mitra et al. (2007), Bindu et al. (2014) and Abujam et al. (2015) as they found male build bubble nest for egg deposition. Degani (1989) also discussed about the territorial behavior of male T. trichopterus. From the present findings it can be said that male are the bubble nest builders. The mating takes place below the bubble nest. The male curves his body and envelopes the female from below (Figure 4). Male begin to prod her tail base with his snout giving a serious of quick thrusts and then female begins to spawn. At the same time male released sperm and fertilized the eggs. This finding is similar to Abujam et al. (2015). In the present study it also showed that the male frequently collected fertilized eggs and attached to the bubble nest. Mitra et al. (2007) and Abujam et al. (2015) also reported the same behavior that the male collecting the dispersed eggs and fixed it to the nest. Mitra et al. (2007) showed territoriality and parental care by guarding the eggs and hatchlings. However, in the present study, after spawning the parents were removed from the tank in next day. Thus parenting behavior did not notice of the species after spawning. In the present study the spawning, fertilization and hatching rate differs significantly among three different inducing hormones. Among three treatments, spawning occurred 100% in case of PG and ovaprim injected fishes whereas only 33% spawned in case of HCG inducing fishes. The fertilization rate was high in ovaprim treated fish and the fertilization rate was 86.7 ± 9.43% (Table 4). Percentage of fertilization was found to be between 55.28 and 71.53 in the study of Abujam et al. (2015). The highest average fertilization rate is more or less similar of the fertilization rate of spontaneously spawned T. fasciata and that was about 94% (Hossen et al., 2014). The fertilization response was poor in case of HCG inducing where fertilization rate was 46.7 ± 9.43%. In contrast, 99.6% fertilization reported by Bindu et al. (2014) without any inducing hormones in case of T. trochopterus. However, no spawning and hence no fertilization noticed in case of the species T. fasciata (Abujam et al., 2015). Thus breeding in captive condition may vary from species to species of gourami fishes. The present findings indicated that the hatching rate is significantly variant (P˂0.05) among the three treatment of hormones. The hatching rate in present experiment was 32- 55 and close to Abujam et al. (2015) for the inducing of the T. fasciata with ovaprim. The hatching rate was maximum (52 ± 3.54%) in treatment T3, where ovaprim was applied. However, the 95% hatching reported by Bindu et al. (2014) in T. trichopterus without inducing any hormones. So, the findings of the present study reveal that the hatching rate is quite good but not satisfactory. The hatching period recorded 23-26 h after fertilization which was supported by Hossen et al. (2014) and Bindu et al. (2014). In both experiments they showed hatching time about 24 hours. However, a bit late hatching reported by Mitra et al. (2007) and recorded hatching period 28-30 hours after egg lying in case of Colisa sota. The all three inducing hormones applied in C. fasciata for the captive breeding showed positive response and effective. However, ovaprim could be most effective one in terms of spawning, fertilization and hatching rate. The inducing hormone PG also could be useful for the species but does not suggest applying HCG for this species. Successful technology for breeding and rearing of a species in captivity is the prerequisite for rehabilitation of natural stocks as well as for culture. The findings clearly demonstrated that the fish respond well with PG and ovaprim treatment. So, any of the hormone can be applied for the induced breeding of the species. However, dose optimization is urgent prerequisite and suggested for further application of inducing of the fish in captive condition. The present study was financially supported by the Ministry of Education, Peoples Republic of Bangladesh. We also thank to the fish farmers of Majdh Baor, Jessore who supplied the broods for the present experiments. Abujam, S.K.S., Paswan, G., Deory, D.J., Bhattacharjee, M., Biswas, S.M. and Patra, B.C., 2015. Captive breeding of Trichogaster fasciata with Ovaprim injection. Int. J. Curr. Life. Sci., 5: 160-166. Axelord, H.R., 1996. Exotic Tropical Fishes. T.F.H. Publications. publications, Inc., New York. Hanitsch, R. (1901): Fishes. Report of the Raffles Library and Museum, 1900: 3-4. Bakos, J., 2015. Technology for fish propagation. FAO corporate document repository, Fisheries & Aquaculture department, FAO. Behra, S., Khan, M.I., Das, S.K. and Nagesh, T.S., 2005. On the fecundity of stripped gourami, Colisa fasciata (Bloch and Schneider). J. Inland Fish. Soc. India. 37: 68-70. Behera, S., Sutradhar, D., Kumar, S. and Gogoi, R. 2015. Testicular cyclicity of Trichogaster lalius during breeding and non-breeding season. Int J Sci Nat., 6: 426-431. Bindu L., Amina. S, Linsha. R, Sreelekshmi. G, and Archana. P. L., 2014. Breeding and early development of the nest building gourami Trichogaster trichopterus (Family Osphronimidae). Int. J. Res. Fish. Aquac., 4: 175-180. Bhuiyan, A.L., 1964. Fishes of Dacca, Asiatic Soc. Pakistan, 13: 111-112. Degani, G., 1989. The effect of temperature, light, fish size and container size on breeding of Trichogaster trichopterus. Isr. J. Aquacult. Bamid. 41 : 67-73. Goodwin, D., 2003. The practical aquarium fish handbook. Sterling publ Co.p: 256. Hossen, M.S., Reza, A.H.M.M., Rakhi, S.F. and Takahashi, K., 2014. 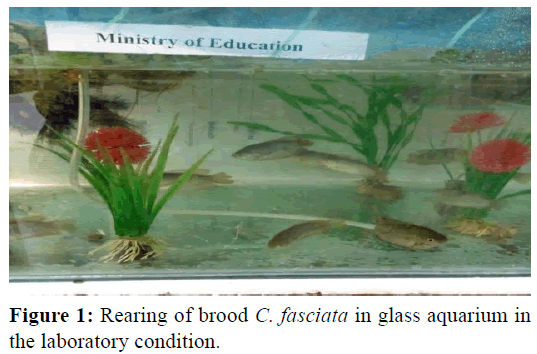 Effects of polyunsaturated fatty acids (PUFAs) on gonadal maturation and spawning of striped gourami, Colisa fasciatus, Int. Aquat. Res., 6:65. Hossain M. A., Taher, M.A. and Sayeed, M.A., 2010. Development of low cost culture technology for indigenous ornamental fish. Bangladesh Agri.Uni. Res. Prog., 07-08 March.Volume 20. Proceedings of the Workshop of University Research System (BAURES), BAU, Mymensingh. Healy, M.C., 1971. Gonad development and fecundity of the goby Gobobus mimitus. Pallas Trans. Am. Fish. Soc., 100: 520-526. IUCN Bangladesh, 2015. Red List of Bangladesh. Freshwater Fishes. IUCN, International Union for Conservation of Nature, Bangladesh Country Office, Dhaka, Bangladesh, 5:235. Mitra, K., Suresh, V.R., Vinci, G.K., Mazumdar, N.N. and Biswas, D.K., 2007. Biology and Fishery of banded gourami, Colisa fasciata (Bloch and Schneider 1801) in a Floodplain Wetland of Ganga River Basin, Asian Fish.Sci., 20:409-423. Sugunan, V.V., Mitra, K. and Vinci, G.K., 2002. Ornamental fishes of west Bengal. Classic printers, Kolkata, India, pp. 108. Tripathi, S.D., 2004. Ornamental fishes: Breeding, culture and trade. In proceedings of the National Seminar or prospects of Ornamental Fish Breeding and Culture in eastern and North eastern India (ed.R.C. Das., A. Sinha, S. Datta and Ghos, S.), Central institute of Fisheries Education, (Indian Council of Agricultural Research), Kolkata, India pp-17-42. Welcomee, R.L., 1988. International introductions of inland aquatic species. FAO Fisheries Technical Paper pp: 294-318.